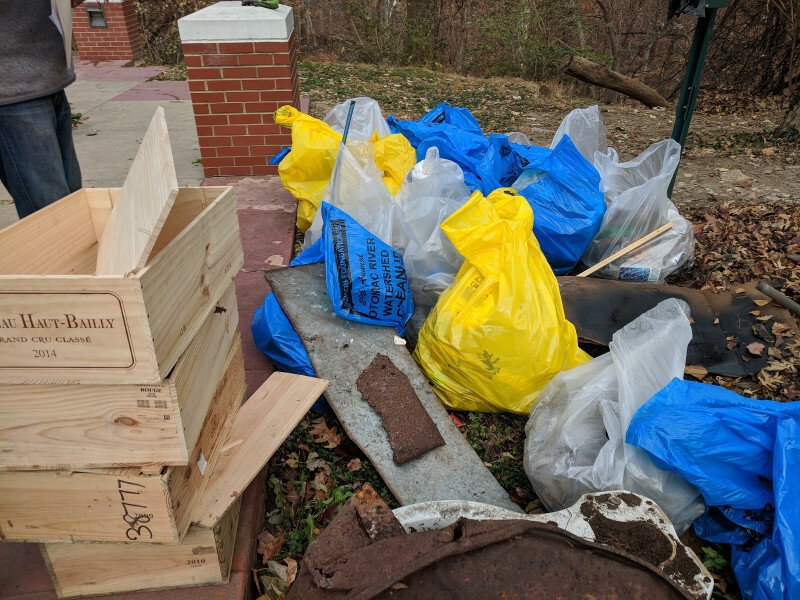 Twelve volunteers showed up the morning of Saturday, December 2nd to tackle the trash that collects (or is thrown) on the steep Soapstone Valley slope abutting the mini park at Connecticut Avenue and Windom Place. The white bags collected were for recyclables, and the yellow for other stuff. 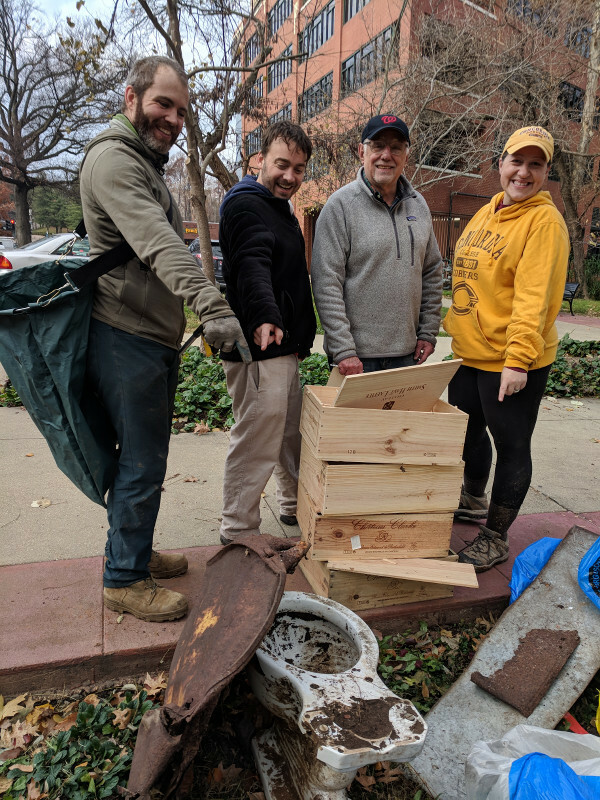 The biggest catches of the day were made by Robert Fox, who dug out a toilet and carried it up to the collection point, and Pat Jakopchek, who hauled in a smashed metal drum. 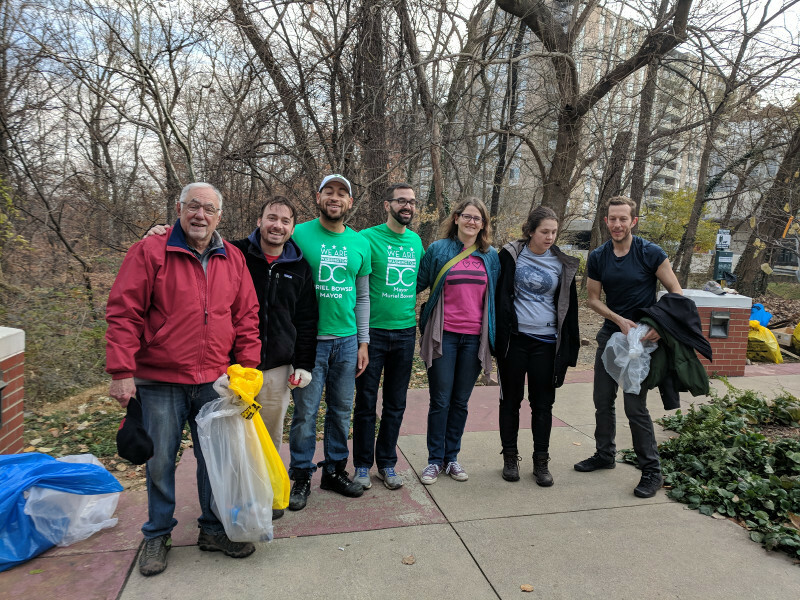 The cleanup was organized by newly-elected ANC 3F Commissioner Bill Sittig and Jakopchek, who is 3F’s acting chair and the chair of the ANC’s Soapstone Valley-Melvin C Hazen Parks & Trails Committee. Sittig was very proud of the 13 bags of trash and nine bags of recyclables (one was mine), along with the toilet, pipes, wine boxes and sheet metal that had been collected. Ian Maggard and Phil Thomas, who are with the Mayor’s Office of Community Relations, stopped by to lend a hand as well. They filled one bag of trash and two bags of recyclables. Julie Lawson, director of the Mayor’s Office of the Clean City, came by for a few minutes to introduce herself. One volunteer brought up another litter issue: Dog poop bags are being thrown into the Soapstone Valley from one of the apartment buildings abutting the park. He wants to give the apartment building a chance to address the issue. A thank you to all the volunteers who helped clean up the park. Great job all! Wow, a toilet. I thought the 7-8 shopping carts we’ve found over the years were hard to beat! With regard to the dog poop bags, this really is turning into a problem in Forest Hills. Could the offenders be professional dog walkers?